Most of my paintings are non-figurative. I prefer this term to “abstract” because my visual world, though it rarely depicts any specific subject matter, is usually grounded in dynamic, primordial natural forms, especially elements of the human body. The microcosm that is the curvature of an arm may end up evoking the macrocosm of a sweeping imaginary landscape. 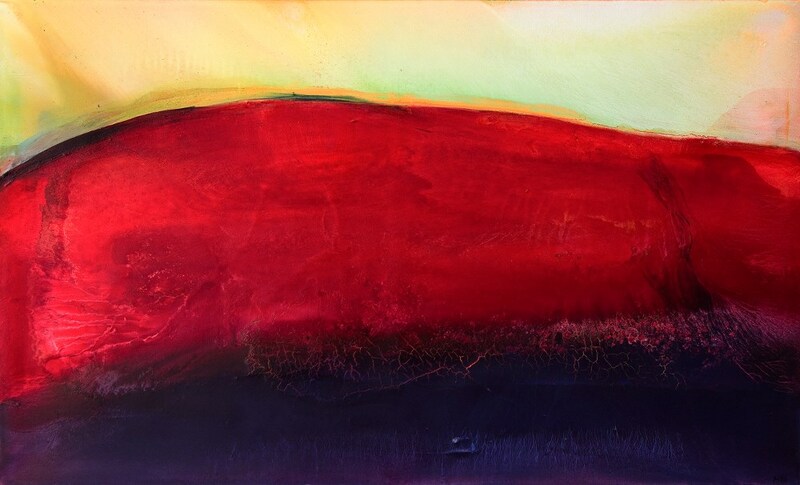 My paintings often call to mind the rich colors and textures of the earth. In creating them, I continue to explore a technique I discovered many years ago that is analogous to the geological processes of sedimentation and erosion that shape the earth. The images evolve in layers, reflecting a kind of dialogue between my will and the chemical reaction of the materials: oil paint, varnish, and turpentine. I start by establishing the underlying composition directly on the canvas or the paper with thick paint and brushes. (This is generally the only brushwork.) I prepare my oils in a liquid form, each color in a separate container. One by one, I pour them on the horizontal canvas, moving it gently and carefully to direct the flow of the paint and control the blending of the colors. Due to the need for the paint to dry before I add the next layer, I work on several paintings at the same time. Layers are added and sometimes partially effaced, over and over, as often as is necessary for the piece to emerge in an incarnation that compels me to stop. In this way, the painting reveals itself over time, making its own sense, discovering its own soul.